Home / Everything Else / How To Get The Right Boots In An Increasingly Expensive Market! How To Get The Right Boots In An Increasingly Expensive Market! I’ve said it time and time again; expensive boots do not make the best boots. We live in a time where the price of boots is on an ever-increasing spiral upward, with no signs of slowing down. Just this past week, the advanced Nike Hypervenom 3 was released to market, with the price for a new top-tier pair jumping from $275 to $299. Yes, top brands like Nike and adidas do put serious amounts of work into developing advanced technology in boots, and this (along with player endorsements) comes at a cost. You’ve got to spend to stay on top. But that is not to say that the added tech is what you need to improve your game. In fact, there are obvious examples of where technology directly plays against the standard needs of some players. It is not difficult to be influenced by promotional media and big star names that are associated with boot silos. I get it, especially for younger players, it is not easy to resist the temptation of wearing the very same style boot on your foot as your favorite superstar. But in reality, and this is really important to understand, big star names get their own unique, customized boots that don’t also correspond to what the brands want you to think they are wearing. You only need to take a look at Lionel Messi as an excellent example of that! With all of this in mind, I wanted to share some thoughts I had on what you need to be looking for in terms of performance, and how you can find the right boot in an increasingly expensive market! There are many types of boots to choose from and a lot of different brands. Some have the ability to spend vast amounts of money on advertising and endorsements, while others invest their money in simply creating quality boots. For the latter, performance can be equal to or better than the big guys, but they simply don’t have enough invested in promoting the product. A prime example of that would be ASICS, and the DS Light X-Fly K. They are one of the best boots we have seen on the market over the past few years, yet how many times have you heard of them outside of this website? Big brands spend so much on advertising and player endorsements that they need to set a high price point on products to make them sell! Open your mind to other options, if the boots come recommended. This is an important one. In order to find the boot that offers you optimal performance you need to know what type of boot category you are looking for. Even though boots are fundamentally sound for all positions, there are pairs that focus on a particular player trait and can elevate your game an extra level. For example, would you want to wear one of the heavier pairs of boots on the market if you were an explosive winger? Or would you wear a pair with an ultra thin upper if you were a no-nonsense hard-hitting defender? The boots don’t make the player, but the right pair can make a HUGE difference! 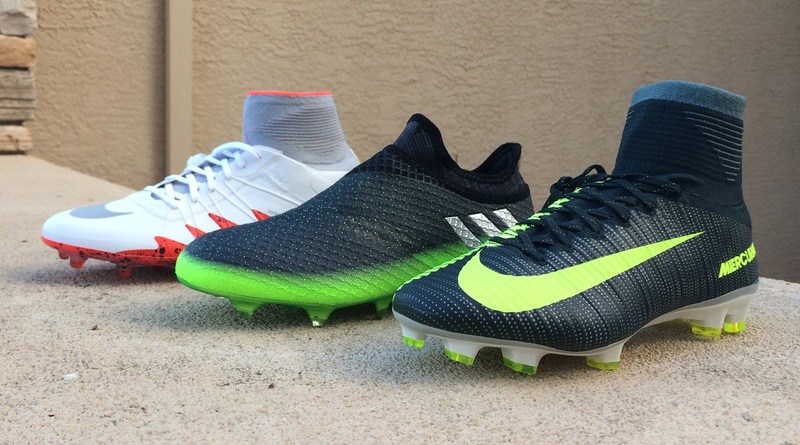 Brands create top-tier boots specifically for professional players. Thus, they are likely to be lighter and designed to provide immediate performance. For the most part, a top-tier boot won’t get you through an entire season. Mid tier boots are built very differently, with a focus on creating a more balanced and functional final product. This means the materials are a little stronger and in-turn you can expect them to last longer. A lower price + plus better durability = Win/Win. Look for sales! Different retailers have offers going on boots all the time and if you can double up a code with some boots that are already on sale, you can basically get 2 pairs of top-tier boots for the price of 1. We have a Steals and Deals page that can help you here, or just follow all of the top stores on your favorite social media platform. The only aspect of this that can get frustrating is the fact not all sizes are usually available, so you really need to get to the deals first and remember to be patient! Although you probably follow must of the above, I hope that you find some of it useful or are able to put it into action on your next pair. I’ll update this post over time with other deals that become available. If you have any additional tips that you’d like to add, leave them down below for others to check out! This is really good information, thanks. It is always so tempting to buy the top tier boot, but in reality for us amateurs it won't make too much difference. I wonder how much of it is a mental thing. I do always think I play better if I am wearing expensive boots! Which one do you think is better the Adidas gloro 16.1 or the Copa 17.2 ?